For many decades Robin Skelton lived here with wife as the major literary presence in Victoria. 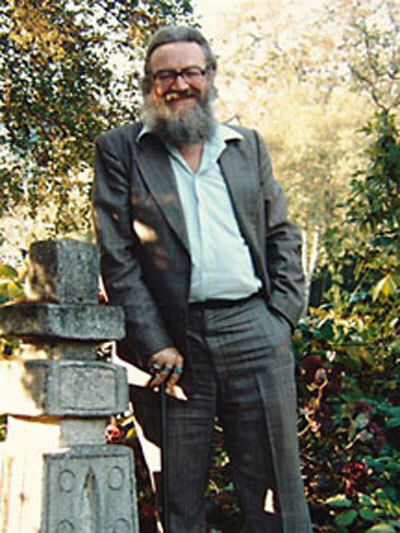 He taught at the University of Victoria for almost 30 years, teaching in the Department of English and then in the Department of Creative Writing, of which he was the founding Chairman in 1973. In 1967, together with John Peter, he founded The Malahat Review, and he edited until 1982. The house was the venue for many literary gatherings. Poet, anthologist, editor, teacher, biographer, art and literary critic, historical writer, initiated witch and occultist Robin Skelton was born in 1925 in Easington, East Yorkshire, England. He went to the University of Leeds and taught at the University of Manchester until 1963, when he immigrated to Canada. Skelton became a fellow of the Royal Society of Literature, and a Chairman of the Writers’ Union of Canada. Skelton was also a driving force behind the creation of a Special Collections division of the University of Victoria library. Mainly a poet, Skelton published four fiction collections, The Parrot Who Could, Telling the Tale, Hanky Panky and Higgledy Piggledy, as well as one speculative novel, Fires of the Kindred. As one of Canada’s most high-profile male witches, he was once called to serve as an expert witness at Victoria’s “100 Huntley Street” witchcraft trial that resulted in a legal distinction between Satanism and witchcraft. His books pertaining to witchcraft and ghosts were Spellcraft, Invocations and Blessings, A Gathering of Ghosts and The Practice of Witchcraft. A mentor to Susan Musgrave at the outset of her writing career, Skelton was a major figure in the literary community of southern Vancouver Island where he directly influenced the operations of Morriss Printing and Sono Nis Press. Robin Skelton died on August 22, 1997. Harold Rhenisch helped gather a collection of poems that Skelton had completed shortly before his death for a posthumous volume, Facing the Light. In 2007, the Malahat Review celebrated its fortieth year in print and also marked the tenth anniversary of the death of Robin Skelton, the magazine’s co-founder and long-time editor, by publishing a tribute issue in the Fall of 2007 (Issue No.160) in his honour, in conjunction with a literary festival at the University of Victoria and around the city of Victoria. Some of the events included an art exhibit of The Robin and Sylvia Skelton Collection at UVic’s Maltwood Gallery, a display of Skelton’s papers held by the McPherson Library, a public lecture by Robert Bringhurst, a gala poetry reading at the Art Gallery of Greater Victoria, and an exhibit of Skelton’s collages at the Emily Carr Gallery. Three performances of “Robin Skelton: A Living Collage,” a multi-media event created by Tim Gosley, a Victoria-raised, Toronto-based puppet artist, were also staged. 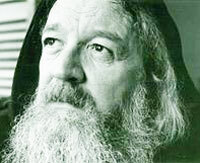 Patmos, And Other Poems. London: Routledge, 1955. Third Day Lucky. London: Oxford University Press, 1958. Begging the Dialect: Poems and Ballads. London: Oxford University Press, 1960. The Dark Window. London: Oxford UP, 1962. Selected Poems, 1947-1967. Toronto: M&S, 1968. The Practice of Poetry. 1971. A Different Mountain: Messages, 1962-1970: Poems And Photo-Collages. Santa Cruz, Calif.: Kayak, 1971. Callsigns. Victoria: Sono Nis Press, 1976. Because of Love. Toronto: M&S, 1977. Spellcraft: A Handbook of Invocations and Blessings. Sono Nis Press, 1978. Landmarks. Victoria: Sono Nis Press, 1979. Collected Shorter Poems, 1947-1977. 1981. Limits. Erin: Procupine’s Quill, 1981. The Paper Cage. Lantzville: Oolichan Books, 1982. House Of Dreams. Erin: Porcupine’s Quill, 1983. Wordsong: Twelve Ballads. Victoria: Sono Nis Press, 1983. The Man Who Sang In His Sleep. Erin: Porcupine’s Quill, 1984. The Collected Longer Poems, 1947-1977. Sono Nis Press, 1985. Distances. Erin: Porcupine’s Quill, 1985. Fires Of the Kindred. Victoria: Porcepic Books, 1987. Telling the Tale. Erin: Porcupine’s Quill, 1987. The Parrot Who Could. Sono Nis Press, 1987. The Memoirs of A Literary Blockhead. Toronto: Macmillan, 1988. Openings. Victoria: Sono Nis Press, 1988. Portrait of My Father. Sono Nis Press, 1989. A Gathering of Ghosts. Western Producer Prairie Books, 1989. With Jean Kozocari. The Practice of Witchcraft. Porcepic, 1990. A Devious Dictionary. Cacanadadada, 1991. With 13 collages by Ludwig Zeller. Higgledy Piggledy. Vancouver: Pulp Pres, 1992. Popping Fuchsias: Poems, 1987-1992. Vancouver: Cacanadadada, 1992. A Formal Music: Poems In Classical Metres. Victoria: Reference West, 1993. Islands: Poems in The Traditional Forms And Metres Of Japan. Victoria: Ekstasis Editions, 1993. I Am Me: Rhymes For Small. Victoria: Sono Nis Press, 1994. A Way Of Walking: Poems In The Traditional Forms And Metres Of Japan. Victoria: Ekstasis Editions, 1994. Wrestling the Angel: Collected Shorter Poems, 1947-1977. Victoria: Beach Holme, 1994. The Edge Of Time: Poems And Translations. Or So I Say: Contentions & Confessions. One Leaf Shaking: Collected Later Poems, 1977-1990. Victoria: Porcepic, 1996. The Shapes of Our Singing. Eastern Washington University Press, 1999. Facing the Light (Ekstasis, 2006). In This Poem I Am: Selected Poetry of Robin Skelton (Dundurn, 2007). Selected and edited by Harold Rhenisch. Robin Skelton owned more than 90 rings, collected more than 4,000 78 rpm records and published more than 100 books. He was fond of Irish whisky and flea markets; he never learned to drive a car and he disliked telephones. 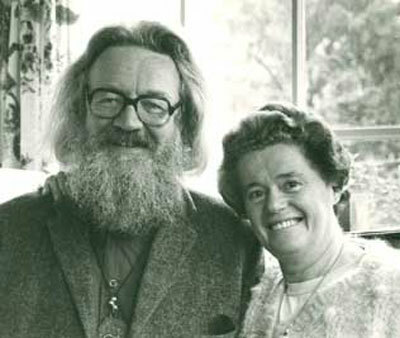 As a Wicca witch and a poetry guru, he blessed houses, banished ghosts, cured Margaret Atwood’s arthritis, helped Marilyn Bowering to conceive and rescued Susan Musgrave from the psychiatric ward on her 16th birthday by proclaiming, “You’re not mad, you’re a poet.” And when he died at home in Oak Bay, on August 22, of congestive heart failure, at age 71, as evidenced by the loving testimonials by the likes of Musgrave, Margaret Dyment, Yvonne Owens, Adrian Chamberlain, Marilyn Bowering, Margaret Blackwood and Joe Rosenblatt, the sense of loss, particularly in Victoria, was acute. Having Skelton on the streets, as poet Linda Rogers put it, was like living near Merlin. Skelton was born in Easington, East Yorkshire on October 25, 1925, the son of a schoolmaster. An only child, he read Chaucer before age seven. He studied at Leeds University and Cambridge, taught English Literature at Manchester University for 12 years, grew his famous beard (when beards weren’t allowed) and served with the R.A.F. in India (codes and ciphers) from 1944 to 1947. He published his first book, Patmos and Other Poems, in 1955, along with a biography that same year, John Ruskin: The Final Years. Taking his first wife to St. Ives for a holiday, hoping to revive a failing marriage, Skelton met the artist Michael Snow who promptly fell in love with Skelton’s wife. Both couples divorced and remarried their opposite spouses, remaining friends thereafter. Married to Michael Snow’s ex-wife Sylvia in 1957, Skelton emigrated to Canada in 1963 to teach English at UVic. With John Peter he co-founded The Malahat Review in 1965 and was Malahat editor from 1971 to 1982. He was founding chairman of UVic’s Creative Department, established in 1973. He was editor at Sono Nis Press from 1976 to 1983. He chaired the Writers Union of Canada, 1982-83, and co-founded the Society of Limners with his wife and other Victoria artists. With his dear friend Charles Lillard, who died earlier this year, he sponsored readings and publications under the aegis of The Hawthorn Society. The Skelton’s house, built in 1912, was an important focal point for Victoria’s art community. Prolific as a writer, critic and anthologist, Skelton was a self-described ‘minor Pooh-Bah’ and Libra whose belief in witchcraft, and his public practice of witchcraft, was enormously important to fellow Wiccans. In 1978 he was initiated into the ‘Old Religion’ by Jean Kozocari, with whom his daughter Alison had been studying, and later co-authored with Kozocari A Gathering of Ghosts (1989), earning him the accolade of ‘ghostbuster’. He testified in the ‘100 Huntley Street’ witchcraft trial in Victoria and once conducted an (as-yet) unsuccessful ritual on Parliament Hill to convince Ottawa’s politicians to repeal the GST on books. Just a few of Skelton’s many books include Spellcraft (1978), The Collected Shorter Poems, 1947-1977 (1981), The Collected Longer Poems, 1947-1977 (1985), Memoirs of a Literary Blockhead (1988), The Practice of Witchcraft (1988), The Parrot Who Could (1986) and Popping Fuschias: Poems 1987-1992 (1992). Having tried to discover every verse form on the planet, Skelton wrote at least one poem in each form during his old age. The result, The Shapes of Our Singing, will mark an appropriate end to Skelton’s varied career upon its publication in 1999 by Eastern Washington University Press. 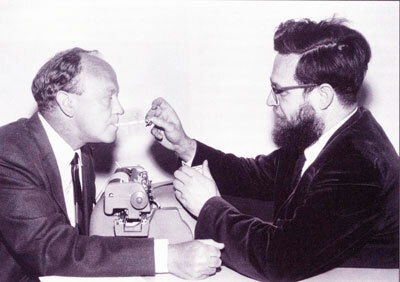 Robin Skelton and and novelist John Peter, 1966. While E.T. calls home, Ghostbuster Bill Murray should call Robin Skelton. Skelton, a practicing witch in Oak Bay, has just co-written A Gathering of Ghosts (Western Producer Prairie $22.95), a casebook of hauntings and attempted exorcisms undertaken with Jean Kozocari. Kozocari, who conducts seances, can trace her family’s involvement with witchcraft to the 15th century. Skelton, author of over 70 books, recently testified as an expert witness at Victoria’s highly publicized 100 Huntley Street/witchcraft trial (resulting in a legal distinction being made between Satanism and witchcraft). “Most hauntings can be explained,” says Skelton, “once the necessary research has been done.” In the opening chapter of A Gathering of Ghosts the so-called ‘hanging judge’ of the Cariboo, Sir Matthew Baillie Begbie, inexplicably appears in a Polaroid photo taken in 1978. This photo is taken on property originally inhabited by Begbie, who died in 1894. An exorcism is held, with appropriate incantations. But despite the best efforts of Skelton and Kozocari, Begbie holds his ghostly ground. A Gathering of Ghosts and a previous Skelton book, The Practice of Witchcraft, are both receiving publication in England. Meanwhile Skelton has two more new books this fall, Celtic Contraries (Syracuse University Press) and A Portrait of my Father (Sono Nis $9.95). The latter book is an affectionate and humourous memoir of Skelton’s somewhat eccentric and bookish father, a schoolmaster in a small Yorkshire village. Beginning August 31 and running until November 15, 2007, the University of Victoria’s Maltwood Art Museum and Gallery invites art lovers everywhere to visit The Hold of Our Hands: Art from the Robin and Sylvia Skelton Collection. Profiling donations made to the University of Victoria art collection by the late poet, academic, and artist Robin Skelton and his wife, calligrapher Sylvia Skelton, this is a survey exhibition of over eighty paintings and prints by West Coast and Irish artists, including a significant collection of prints by Irish artist Jack. B. Yeats. It will be on view in the Maltwood Art Museum and Gallery, which is located in the University Centre building at the University of Victoria. Opening hours are from 10 am to 4 pm, Monday through Friday, with occasional evening and weekend openings in conjunction with Farquhar Auditorium events. Admission is free. The Hold of Our Hands is one of many events this fall that are part of The Malahat at Forty: A Celebration of Robin Skelton, which marks the tenth anniversary of Skelton’s passing and the fortieth anniversary of The Malahat Review, the literary journal which Skelton helped create in 1967. 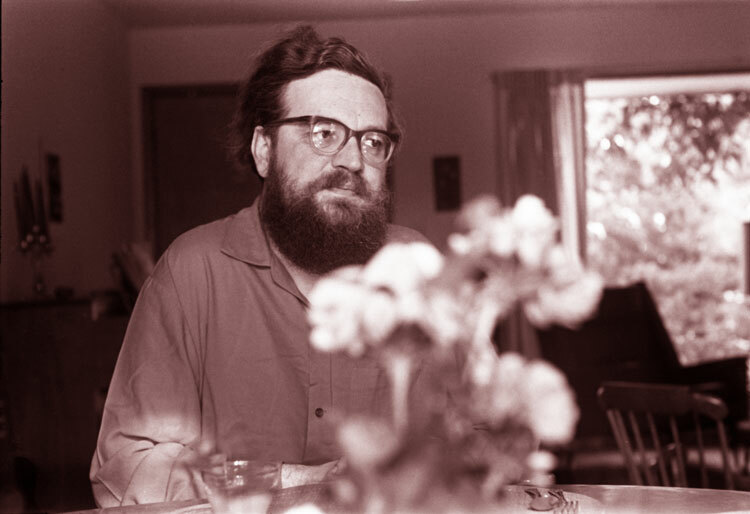 Known internationally as a poet, editor, and publisher, Robin Skelton was born in England in 1925 and joined the faculty of the University of Victoria in 1963. Key to establishing the Department of Writing, Special Collections at McPherson Library, and The Malahat Review, he published over one hundred books of poetry, fiction, criticism, history, and on witchcraft, was a renowned collector of art, and a collagist. When he died in 1997, he left the world a legacy of cultural excitement still relevant today.